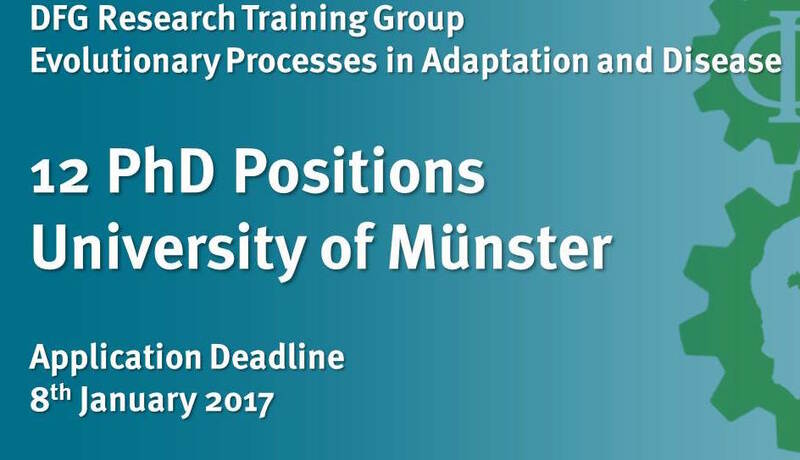 The new DFG-funded Research Training Group “Evolutionary Processes in Adaptation and Disease” (EvoPAD, GRK 2220) unites biological, medical, and philosophical research at the University of Münster, Germany. The core idea is to use the theory of evolution to understand processes leading to adaptation and/or disease. 12 PhD students will work on advancing evolutionary theory, and in turn, apply modern evolutionary approaches to medical questions. EvoPAD doctoral researchers will perform cutting-edge research in an interdisciplinary environment. Our multidisciplinary qualification program is tailored to individual career tracks, and offers opportunities for international cooperation, summer schools, and courses covering evolutionary and population genetics, bioinformatics, experimental design, philosophy of science, and bioethics. EvoPAD is coordinated within the stimulating city of Münster near Münster’s University Palace and offers a family friendly and international atmosphere. See webpage for details of application process and projects.